Capture the Flag is back for Jazz Fest's 50th anniversary! 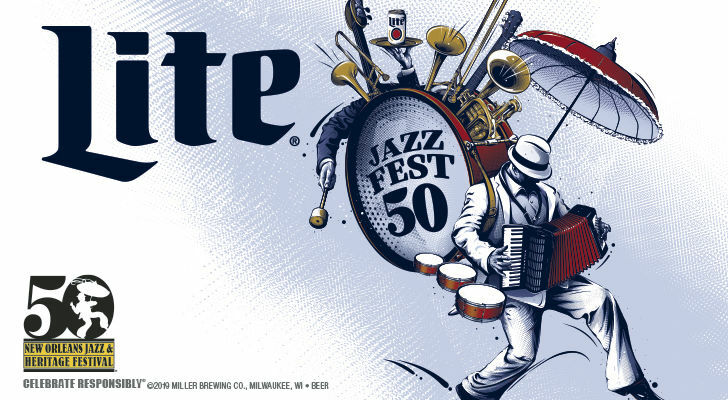 We’ve teamed up with Miller Lite® to get you and a friend to Jazz Fest for free. All you have to do is find our festival flag – sounds easy, right? A few updates for 2019 - here's how it works. Follow @gambitneworleans on Instagram, @gambit_goods on Twitter, and like our Facebook page to be notified when we release a clue. Every Friday from March 29-April 26, we'll post a new clue directing you to a mystery location in the Greater New Orleans area along with a 15-minute window to be there. 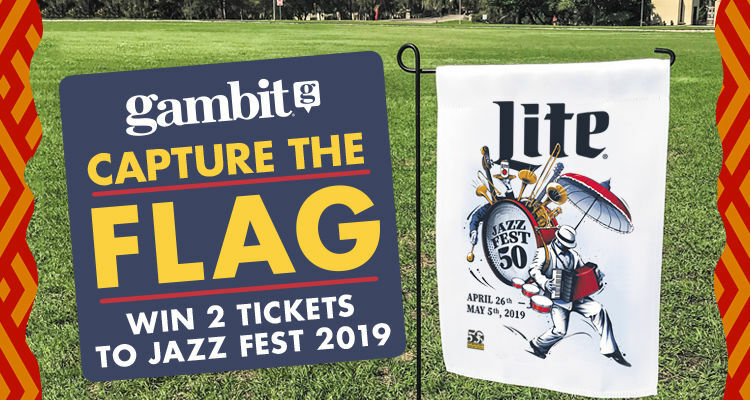 Solve the clue and show up to the mystery site during the specified time frame to enter a drawing for tickets to Jazz Fest and some great Miller Lite gear (Multiple ticket winners will be selected at each flag drop). Pro tip: Turn on notifications so you never miss a post. Catch us if you can! *Please note: Only one winner per household is permitted in the 2019 Capture the Flag Promotion. Employees of Capture the Flag mystery locations are not eligible to participate in the contest round hosted on site at their employer’s business. Must be 21+ to participate. NO PURCHASE NECESSARY. A PURCHASE WILL NOT INCREASE YOUR CHANCES OF WINNING. VOID WHERE PROHIBITED BY LAW. 1. Open to legal residents of the Continental United States. 2. Must be 21 years or older to enter to be eligible to win listed prizes, unless otherwise stated. 3. No substitution or transfer of prize permitted. Prizes are non-redeemable for cash. 4. Gambit Communications Inc. reserves the right to refuse any submission for any reason. 5. Odds of winning depend upon the number of eligible entries received. 6. Winners will be notified by email or telephone. 7. Employees of Gambit Communications Inc., its subsidiaries, affiliates, and their families are not eligible to enter. 8. For the names of the prize winners send a SASE for receipt within 60 days following the end of the Promotion Period to the attention of Marketing Department at the below address. Please be sure to specify the name of the Promotion for which you are requesting the winners list. Gambit Communications, Marketing Department, 823 Camp St., New Orleans, LA 70130. 9. By entering, participants agree to release and hold harmless Gambit Communications and any other sponsors of the contest, their parents, subsidiaries and affiliated entities, and each of their respective directors, officers, employees, attorneys, agents, and representatives from any damage, injury, expense, cost, death, loss, claim, action, demand, or other liability that may arise in connection with the Contest, or resulting from their acceptance and/or use of any prize, their travel to or from any prize related activity, their participation in this promotion, or from any misuse or malfunction of any prize awarded, including, without limitation, personal injury, death, and/or property damage. 10. By participating, entrants agree to be bound by these Official Rules and the decisions of Gambit Communications, which shall be final and binding with regard to all matters relating to the Contest.